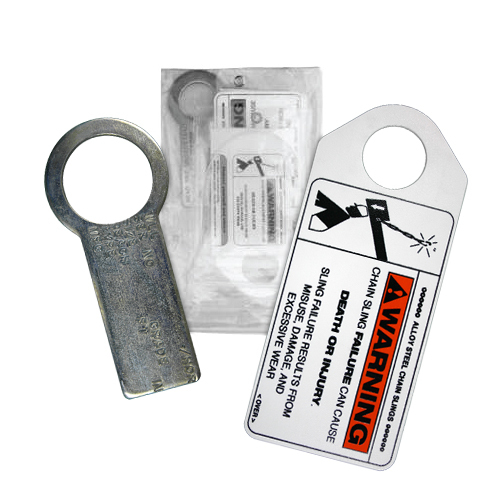 This handy kit combines both a steel tag (to be stamped by competent person) and warning tags / documents, all in one sealed kit. It also comes with a nylon tie so that once the kit is received and assembled, it can be quickly installed. This is a great kit to hand out to shop foremen, superintendents, etc., as it gives them all they need to properly tag a chain sling for OSHA compliance. Full kit contents listed below. We have rigging tags on chains/hooks similar to what you have. Problem is our paint line. We blast and paint off a trolley system. The tags get loaded with paint and/or the tags get blasted. Both conditions make them illedgible. Any suggestions?? It is hard to say for sure what will work in your situation, but I would think a clear silicone spray would help. It is nearly impossible to paint over silicone. Blasting may be another story, but reapplying clear coats might do the trick.